It's been a while since I've posted. I'm deep in the data analysis and modelling mode now. I've been trying to convert information I have on vehicles which is represented as lines in a shape file to raster data, and had a major success today. I thought I would share this since I could fine no reference to the problem elsewhere. 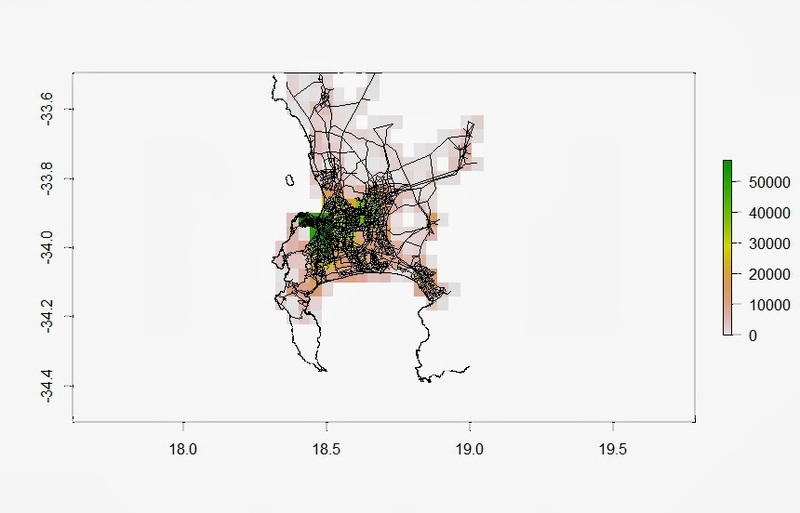 I'm using R to do my GIS manipulations, particularly the packages rgeos, raster and ncdf. So the problem is: I have line data in a shape file, but I want it as raster data (i.e. represented in pixels). I'm interested in a particular field (in my case the number of vehicles per hour on a road). This data is represented as a line, which has a field for number of vehicles on that road in an hour. There are functions in R which can rasterize data. where VehAMPKhrpoll is my shape file which I've imported into R and reprojected. But I found with this function that the sum over all the lines for the field of interest does not equal the sum for this field over all the pixels. This was a major problem for me. The model for the vehicle numbers already has errors, and I didn't want to compound those errors by incorrectly rasterizing my data. So after a few days of hacking away at R code I managed to come up with this function which uses the extent from a NETCDF file which has the extent I require, and then rasterizes the line data from my shape file, by cropping the lines within a particular pixel, then extracting the lengths of each line in the pixel, then dividing the length of that line by the original length of the line to get the proportion of the line inside the pixel, and then multiplying the field for that line (i.e. number of vehicles) by the proportion, so that the value of the field for that line inside the pixel is proportional to how much of the line is in the pixel. And in this way, if I sum over all my pixels, I obtain the sum over all my lines for that particular field of interest.